In this ambitious and moving book, Frank Pommersheim, who lived and worked on the Rosebud Sioux Indian Reservation for ten years, challenges the dominant legal history of American Indians and their tribes—a history that concedes far too much power to the laws and courts of the "conqueror." Writing from the perspective of the reservation and contemporary Indian life, Pommersheim makes an urgent call for the advancement of tribal sovereignty and of tribal court systems that are based on Indian culture and values. 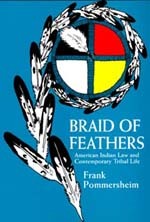 Taking as its starting point the cultural, spiritual, and physical nature of the reservation, Braid of Feathers goes on to trace the development of Indian law from the 1770s to the present. Pommersheim considers the meaning of justice from the indigenous point of view. He offers a trenchant analysis of the tribal courts, stressing the importance of language, narrative, and story. He concludes by offering a "geography of hope,"one that lies in the West, where Native Americans control a significant amount of natural resources, and where a new ethic of development and preservation is emerging within the dominant society. Pommersheim challenges both Indians and non-Indians to forge an alliance at the local level based on respect and reciprocity—to create solidarity, not undo difference. Frank Pommersheim is Professor of Law at the University of South Dakota School of Law. He also serves as an Associate Justice on the Rosebud and Sioux Tribal Court of Appeals and as Chief Justice on the Cheyenne River Sioux Tribal Court of Appeals.